– Let’s talk about Coaching – Do you have a Business Coach? I just had a personal 1-on-1 coaching session with a Private Coach. He’s a master at traffic and conversion and a big proponent of creating evergreen content and getting massive exposure. I’ve learned a lot from him in these sessions. Yes, this Coach has a lot of FREE training available and even paid training courses. And as valuable as all of this information is to your success there is nothing that kicks you into a higher gear that's better than a Coach. Engaging a Coach in a 1-on-1 situation is key to your growth and success. I’m sure that you’ve heard before that you don’t “know what you don’t know” so you’re unconsciously incompetent of some of the little things you need to know to get you to the next step. Having a coach talk through your DMO (daily method of operation) and some of your processes gives them a view into your back office. It’s here where they can point out the flaws in your system. Whether you have too many things going on or you’re missing a few steps, taking advantage of their experience gets you to the next level that much faster. So, after you get your systems set up and your online marketing foundation built, get a coach. They will cut weeks and months off of your learning curve and get you to generating traffic, leads and conversions much faster than you could on your own. Remember they were right where you are at one point in their life. Oh, and don’t think coaches are only for newbies. You would be surprised how many 6, 7 and 8 figure earners hire coaches to get them unstuck or to the next level. If you’re new – get a Coach. 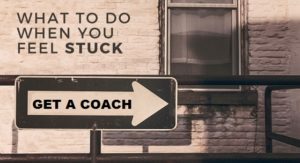 If you’re stuck – get a Coach. Either way it will cut off time and get you where you want to be. It’s the smart thing to do.